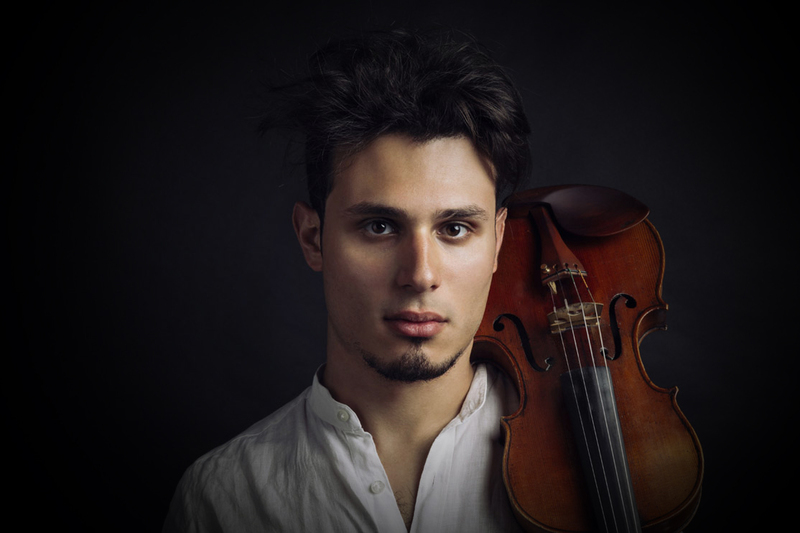 Nicolò Borgese, born in 1992, has studied and played the violin since the age of nine. His musical education, based on the classic studies he underwent at the “Vincenzo Bellini” conservatory in Catania, is varied, ranging from Jazz to Pop & Rock. He won a scholarship at the prestigious school of Mogol “CET” (European Toscolano Center), where he had the honor of meeting some of the most prominent figures in the Italian music, such as Gianni Morandi, Enrico Ruggeri, Pupo, Paoli Belli, and many others. He won the “Officina Sinfonica” competition at the “Orchestra Sinfonica Siciliana”; he collaborated with the well-known group ”Il Volo” and did part of their orchestral group; he recorded as a soloist the backing tracks used for the inauguration of the cruise ship Costa Diadema, during which the group “Il Volo” also performed. He also played at a concert, as a violin soloist, with the Italian singer “Arisa” at the “Teatro Massimo V. Bellini” of Catania. He was selected by the Parisian “CDMDL” (Centre De Musique Didier Lockwood), one of the most important Jazz violin schools in the world, in which he followed lessons given by the masters Didier Lockwood and Johan Renard, in addition to performing in various concerts. Ha svolto diversi concerti in formazione orchestrale e solistica al Teatro Greco Antico di Taormina, al Teatro Massimo V. Bellini di Catania, al Teatro Politeama di Palermo, al Teatro Vittorio Emanuele di Messina. He performed several concerts, in orchestral groups and as a soloist, at the “Teatro Greco” of Taormina (Sicily), the “Teatro Massimo V. Bellini” of Catania, the “Teatro Politeama” of Palermo, and the “Teatro Vittorio Emanuele” of Messina. He participated in various international music festivals; he played as a representative of the Italian music at the Sennheiser stand at the MusikMesse of Frankfurt. He collaborates with multinational companies such as Whirlpool and PWC, participating in live music during corporate events.